Booting Linux in Rescue Mode – Start the Virtual Machine created for Database Server. Make sure the Linux bootable disk are inserted into CD-ROM / ISO Image and its supposed to boot from CD-ROM. 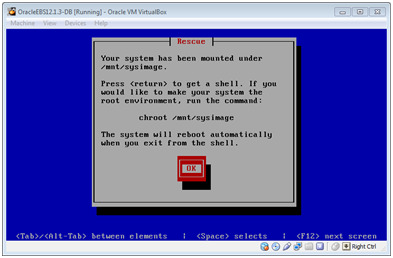 Enter ‘Linux Rescue’ at the prompt and enter to boot linux in rescue mode. 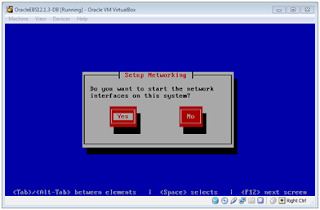 Configure both the network interfaces (eth0 and eth1). Right now we can just make it to use the IP address from DHCP, that will do the job. If you are confident enough your manual configuration will work and accessible from HOST along with Guest able to access the internet. Just enable IPv4 support, that will do the job. Used DHCP to obtain IP information. Now we are done with configuring the first network adapter (i.e Host-Only adapter – used to connect the Guest Machine from HOST). Same we did we have to configure the second network adapter (i.e NAT adapter – it will be used to connect to the internet to download and update kernel files). Same can be achieved by browsing the files from installation media. Now click on Continue and make a note of the mount point where system has been mounted. We need to access that to make the system work. 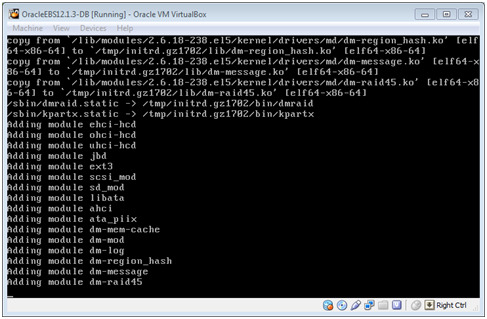 The kernels that are loaded while we booted the system in rescue mode supports Xen Kernel, where as our target kernel will going to support that. To make it work we need to modify modprobe.conf and install new kernel. Before modifying the modprobe.conf its better to make a copy of it, so if something goes wrong we can recover that. 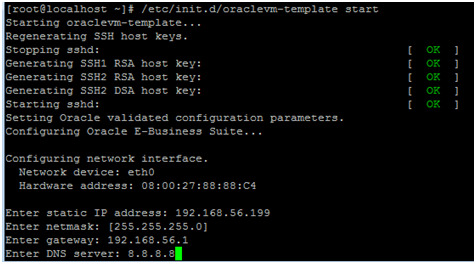 Update the /etc/sysconfig/oraclevm-template to disable automatic template configuration at boot time. 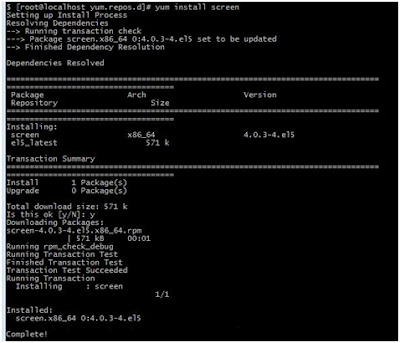 Before running the configuration we need to make sure every thing is fine and we can proceed with template configuration. If we don’t disable then we may have to run through the same process again after boot. We could have directly updated the file, but I though its better not to delete content of the file where as just disable it and add a new entry as we needed. Installing a new Kernel – The kernel that were loaded while booting (Xen) is not going to work with OVM template, to make it work we need to replace it with standard kernel of same version. We could have used the ISO CD-ROM that we used to boot in rescue mode to install standard kernel or we can get it from the internet. I preferred to go over internet (Oracle Public Yum Server) to get the Kernel. That would defilnalty need an internet connection and the NAT adapter will do the job for us. 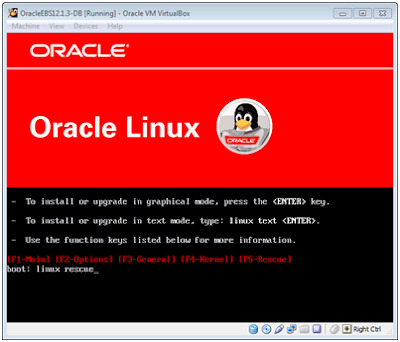 Now install Kernel OL5U6 (2.6.18-238) from Oracle public yum server. Press ‘Y’ to download and install the kernel. Also install ‘screen’ if its not available. For me its not there so I installed it. 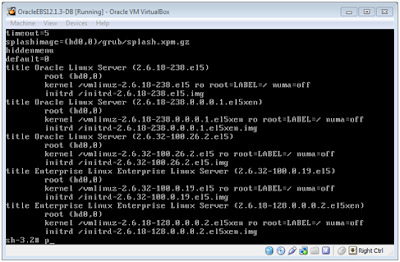 This will be use full to create saved ssh sessions. Upon completion create ‘initrd’ for the new kernel. Now rescue tasks are done. We need to restart the system now. 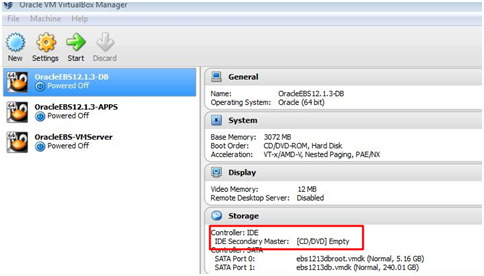 - Remove the disk from CD-ROM or change the boot order from Virtual Machine boot setting. 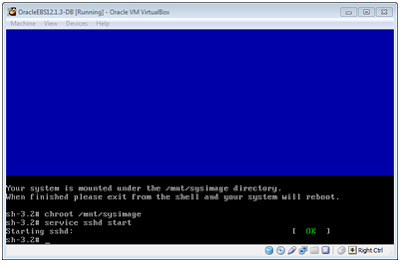 - Start Virtual Machine and login with root user. The default root user password is ‘ovsroot’ as given in the read me file. - The SSH services would be starting automatically this time so no need to start SSH services manually. The image file provided by Oracle already has template configuration script that runs and configure the database server as per our specs. 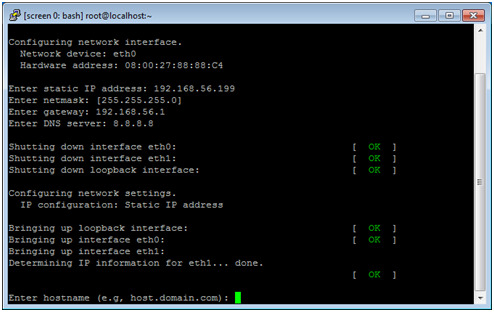 In step it configures network adapters, directory paths, hostnames etc. While we started the system in rescue mode we disabled the script. Now first enable the script and run it. After enabling the script we will execute it. Since we configured our network adapters use DHCP, while configuration we it requires to be changed to a static IP address. 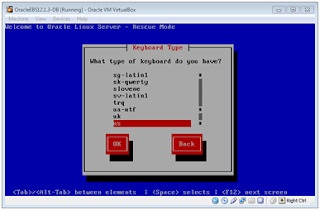 The script will automatically ask you about the details to configure the database server. Make sure to assign an IP address that is accessible in your network and by HOST. Also while the network adapters are configured system will restart the network adapters, So if you are connecting via SSH tools (like Putty) then you will get disconnected from Guest OS. 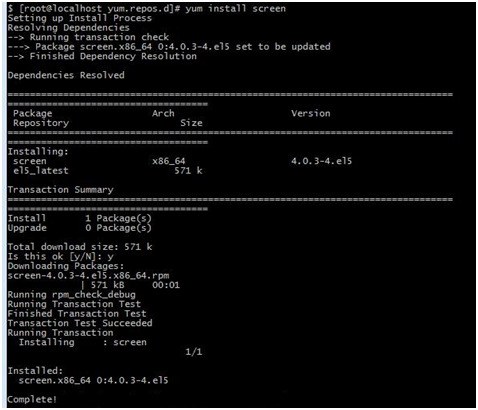 That is the reason we installed ‘Screen’ so that we can recover the session and continue configuration. Its advisable to use Guest console for configuration. I have used Putty, So have saved a session using ‘screen’. 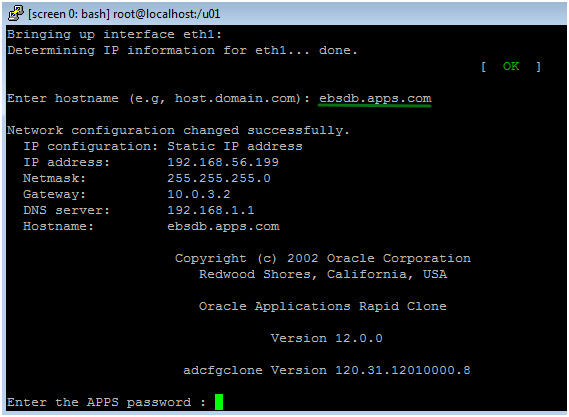 It will ask for static IP address that we want to assign to our Oracle EBS database server. Provide NetMask and Gateway and DNS server as specified in the screenshot above. Once you specified the DNS and press enter the screen stops at this point (because I am using Putty). The network adapter are getting restarted and assigned with new IP address. After few seconds start a new session with new IP address that you assigned and proceed. Just invoke the saved SSH session. Enter valid domain name for database server anything (host.domain.com). After that it will show network summary and ask APPS password to continue (APPS password is ‘apps’ for this instance). There after the script will and configure your vision instance database server. 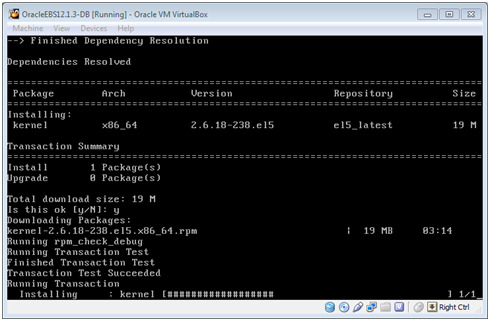 Now database server configuration is completed. 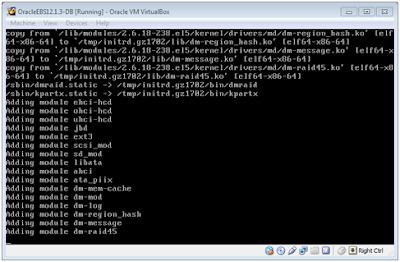 If you check the OracleVM-Template file (/etc/sysconfig/oraclevm-template) you will see the RUN_TEMPLATE_CONF =NO. DO NOT SHUTDOWN DB SERVER WHILE WE CONFIGURE APPS SERVER. 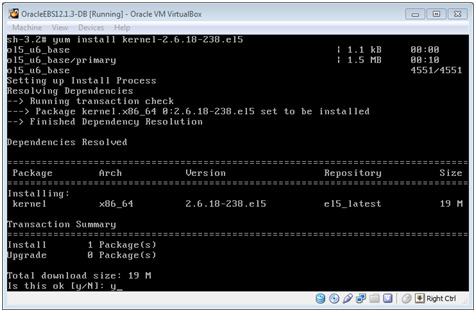 Lets proceed to next section where we will be configuring Application Tier Server. Well when I was doing for the first time I had this issue two and I primarily believe this is because of the ethernet card setup. 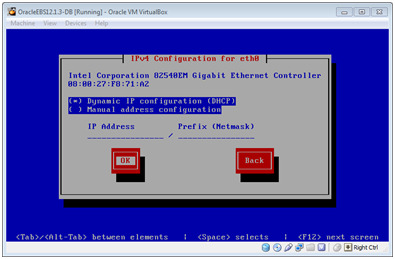 We enabled two ethernets on the virtual machine 'Host Only' and 'NAT'. Check the IP details of 'NAT' adapter. It should be dhcp enabled and have IP address assigned. You can also try by restarting ethernet adapters or by restarting the virtual machine. Also check that your host machine is able to connect to internet and there is no firewall that is blocking the connection. Which is the same as the one you downloaded from yum server. Thank You Very Much for your detailed article. I am technical consultant. First time i am trying to install R12.1.3 VM template in Host desktop with Windows8.1. I have following problems with my install , Could you please help me on this. 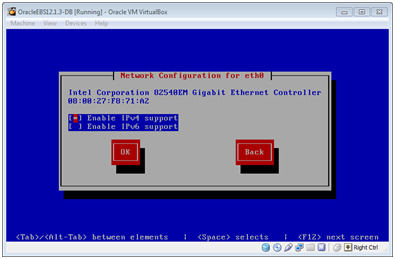 Initially I have setup Host Only and NAT networks in virtual machine. But it not connecting to internet so, i have changed to Bridged Netwrok (I am using WIFI in desktop). 2013-12-22 12:10:22 ERROR 404: Not Found. Its connected to server , but got 404 Not Found error. So , i tried to create the file public-yum-el5.repo manually. Clipboard did not support for me. Then i have used the putty in host machine to create the file manually. 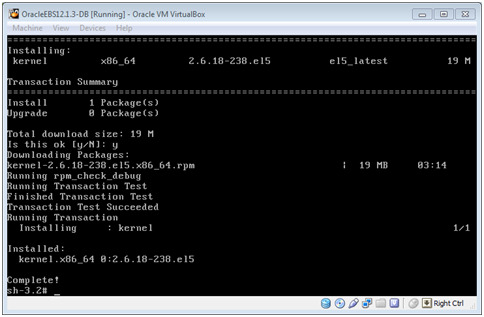 After that i have ran the command "yum install kernel-2.6.18-238.e15" again i have got the following. i can't move forward from here. I found out the issue, i have used the public-yum-e15.repo instead of public-yum-el5.repo. Template is stopped after 50% with following error. Well looking at the error I feel that services were not able to start and while it tries to connect with database its failing. Fortunately I never had this error. Did you started a fresh installation after you figured out you took wrong version of YUM repo.. if not I would say lets try fresh and see ..It should work. Please advise if I need to enter some other command to get to the command prompt. I am new to EBS. I am basically a finance person, with major in accounting. My knowledge of Linux at this stage is very limited. I would appreciate if you can guide me further. You have to follow VI editor command to edit the file. Press 'I' on the keyboard, that will take you insert mode. Now you can use your keyboard arrow to move up and down and delete/backspace to delete the records. Edit the record as mentioned, once done type below in sequence. I am trying to install 12.2.2 on my laptop using the steps that you have mentioned. I am getting stuck when updating the kernel. wget http://public-yum.oracle.com/public-yum-el5.repo is not resolving the host address. I checked some comments earlier in this post where someone changed the adapter from NAT to Bridged, which I tried, but still got the same error. 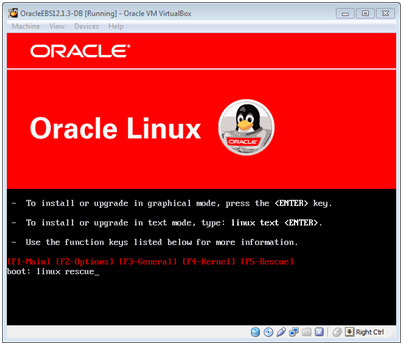 I am using Oracle Linux 5.9 as it was the one that R12.2.2 seemed to be using.